How many times have you heard a similar plea? We work with a number of business and research groups who seek the best, most efficient methods to connect their far-flung workers and keep everyone in the loop on communication, documents, updates, schedules, and project plans. Geographically dispersed teams and work-from-home members intensify the need for workable solutions. Recently, we’ve had success crafting customized “dashboards”. These are online hubs (for example Netvibes, My Yahoo, or iGoogle) that can be tricked out and populated with customizable widgets that display information pertinent to the team. The idea is to integrate information from multiple sources into one comprehensive, easy-to-access and monitor display, resembling an automobile dashboard. The information can be piped in from a wide variety of sources – e.g. updates from online calendars, microblogging streams, email, and RSS feeds from news sources, journals, or blogs. The widgets can also be programmed to serve as access points to other locations on the web – an online document storage system for instance. So, in this way, even online locations that can’t actually be piped to the dashboard can be represented by a widget “doorway” – just click and travel there. The “hub” platforms listed above all offer a similar business plan. The basic service is free, premium service comes with a monthly fee. So far, all of our needs have been met with the free versions. The premium service gets you extra technical support, additional curation and analytical features. So what do these dashboards look like? Here’s a screen shot of a Netvibes dashboard that I set up for my personal use. As you can see, there are a number of “windows” (or, continuing with the auto dashboard analogy, you can think of them as dial readouts). Each window displays a dedicated stream of information. Every time I reload the page, the windows refresh with the latest information from their original source. This one-stop shopping approach saves workers’ time and frustration since all needed information is in one handy, private (password protected) place. The privacy is important – if this is a business group, they will want to protect proprietary information. Perhaps the best way to illustrate how dashboards can work is to give a specific example. We work with a group of medical researchers – a loosely knit team of 50 individuals and sub-groups, spread all over the United States, who meet mostly by phone and rely heavily on email. Keeping track of their collaborative work, their shared documents, and their topical correspondence is a source of tremendous frustration. We started with an evaluation of their needs and concerns. From there, we crafted the dashboard you see below (this isn’t their actual dashboard, for privacy reasons, but a mock-up to look like theirs). The first thing to notice are the tabs across the top. With an endless number of tabs you can subdivide your dashboard into compartments (by team, by function, or required objects). I’ve circled in black the tabs on this dashboard below: “Home”, “Communication”, “Documents”, “Library” and “Executive Committee”. 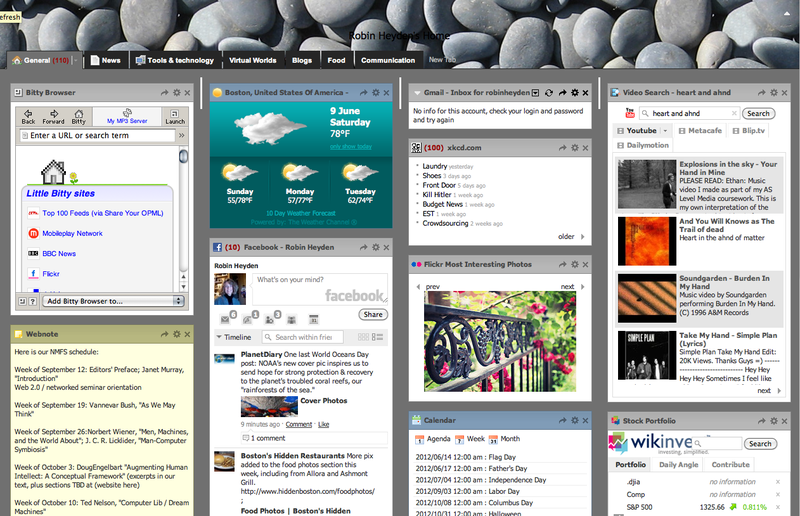 Mocked-up dashboard, showing the organizational tabs. In this view, we’re on the “Home” tab. This is a good place to put general stuff, welcome messages and orientation material. 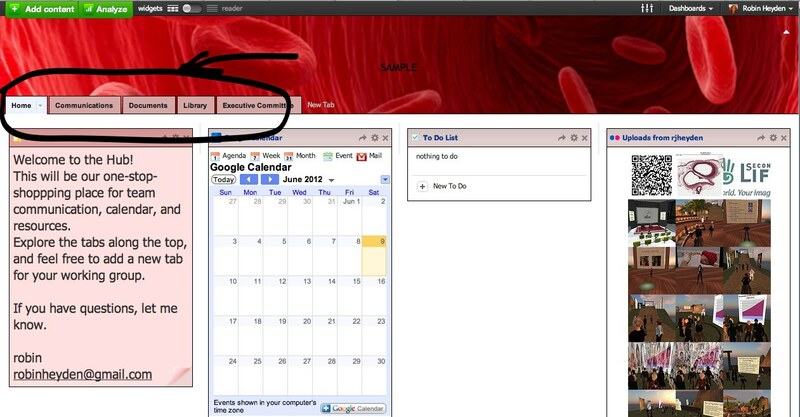 You can also see a Google calendar (project meeting dates and schedule), a to do list, and some Flickr images. To make it more personal, you can include a short talking-head video of your community manager (using Eyejot), to welcome everyone to the dashboard and give them a dashboard tour by directionally pointing. Note that we customized the dashboard header with an image specific to their work, which could instead be a company logo or an identifying color. Communications tab. 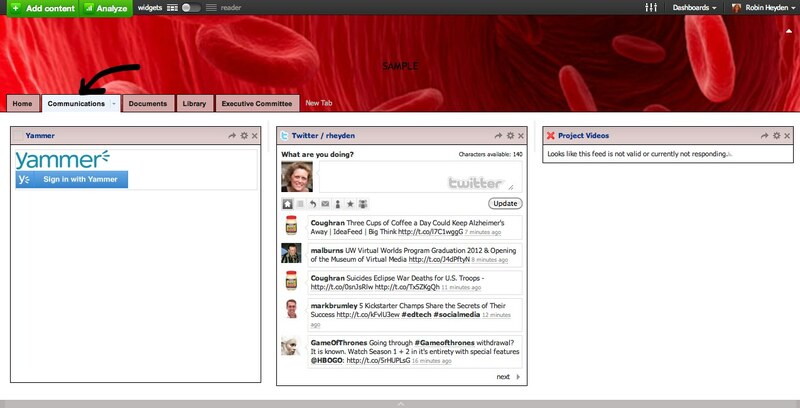 there is a window for a Yammer stream, one for your Twitter stream, or one for email. Each person using the dashboard signs into their account to view it in the widget window. For this project, we created a private Yammer group for the team members. Their Yammer stream displays in its window and posts, replies, and updates can be made from there without traveling to Yammer. Documents tab. Here we’ve placed widgets for Google docs, box.net, and Egnyte; a range of online document creation and storage sites. This particular group prefers to use Egnyte. 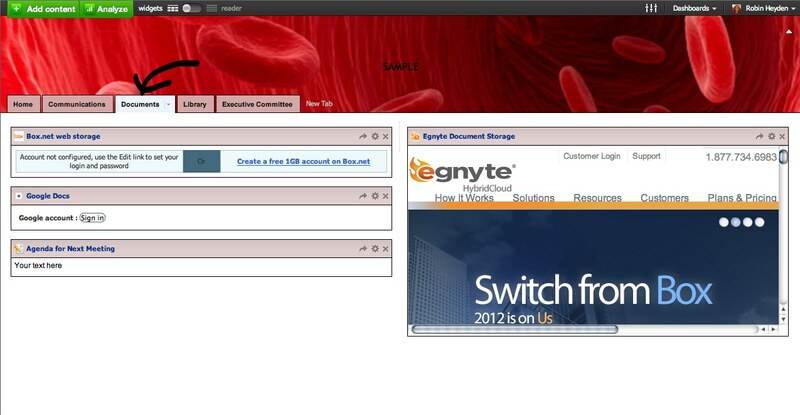 We set up the widget so that they can log in, within the Egnyte widget, and download, upload, or view documents from within the dashboard. If viewing or working within the widget window is awkward they can click on the widget’s top bar and a new browser window, displaying the Egnyte site, will open. Library tab. As the name implies, this is the place to display RSS feeds from journals, online news sources, or relevant blogs. All required reading in one, handy spot. The final tab, for the Executive Committee, features a window to a wiki site for posting meeting agendas and minutes and collaborating on documents. We already have a project management tool, why do we need another one? Is it too complicated? Too difficult to learn? What about security? Will our information be protected? Will my corporate or university firewall let me in? We worked through their concerns step by step. Because we’d planned carefully, we were able to roll out a populated dashboard to the group with useful items on view that they recognized (a video with someone they knew, the Egnyte interface, etc). We provided orientation sessions in a series of brief webinars, focused on just one function per training session. Participants observed (in a shared screen environment) and asked questions as the trainer walked through dashboard tabs and demonstrated how each function operates. Following each training, participants were assigned three brief homework tasks: all things they needed to do which are easier to do from the dashboard. Subsequent trainings featured other functions. Yammer, wiki use, blogging, document curation, and metatagging followed. Once the group started to use Yammer, the penny dropped. They could see the value in the tagging and they could begin to see the dashboard advantages. It’s not perfect. One member institution’s firewall blocked Netvibes and we had to make special arrangements.Yes, they do have other project management software, but none that weave together the communication and RSS feed functions with the other, more typical project management features. Some participants are still not on board, but they are beginning to feel the tug of the larger group when the phrase, “it’s on the dashboard!” is used multiple times in a status meeting. So, what we want to do is to reinvigorate the “brochure project” that you used to assign by using new media tools so that your students will be able to create and share digital stories. But, as we discussed, you want to think through the instructional plan before we jump to discussion of tools. You mentioned that you were interested in formative assessment for your students, so regardless of what method you (or they) choose to create their succession project, I would suggest requiring them to storyboard their story first. Storyboards are paper plans for the eventual project – a roadmap of the story they plan to tell. The great thing about storyboards is that it forces the producer (your student) to grapple deeply with the concepts before they get caught up in the fun and zeal of the technology. They make sure (and you can see) that they understand the biology behind the story and they have a firm grip on their plan, before they invest in the creation. Here’s a great site that explains what a storyboard is and why it’s important to do. Here’s a site that will send you a free pack of storyboard templates. And here’s a web-based set of printable storyboards. And here’s another. The other thing to keep in mind with these participatory media tools is the “participation” part. By posting their stories online, it’s a tremendous opportunity to share, do peer review, and get others to comment on the students’ work. That is what you sometimes here referred to as “the network effect”. Get people talking – get them to share, reference each other, build on each other’s stories. If they feel that they have an audience, that there are other people listening/watching, the quality of the work, the amount of time they invest (and, of course, what they get out of it! ), will increase. Video: Home-made videos can be very powerful. And with video cameras being so cheap these days, it’s relatively easy for students to produce their own videos. You can buy a Flip video camera for ~ $90. 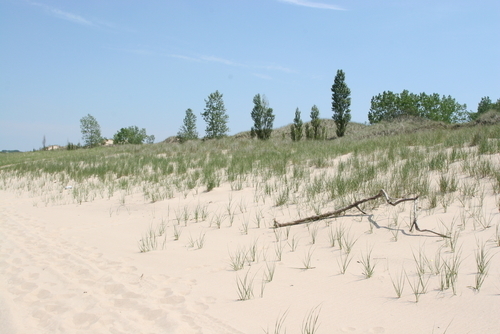 Armed with their camera, your students could go out and shoot some footage at the Dunes then, using some simple editing software, create a movie to tell the succession story. Podcasting: I’m a big fan of podcasting (reminiscent of radio…). What I like about it is that it’s relatively simple and low tech. You just use an ipod or any of a number of cheap digital audio recorders. Record an interview with an expert or a student talking through story, timeline, or a series of images. You can leave it there, with just the recording (up on a web site or on iTunes, for anyone to listen or download), or you can play with the audio recording to enhance it. To do that, you import the podcast into an editing tool (Garageband on the mac, Audacity on the PC) and then add images or video clips to the audio. Present.me: Another free web tool. With this one you can create fully recorded sessions, with slides (PPTs). One stop shopping here – you get the video of the presenter, their voice, and the images. Blogging: Blogs are great tools for reflection and growing community. 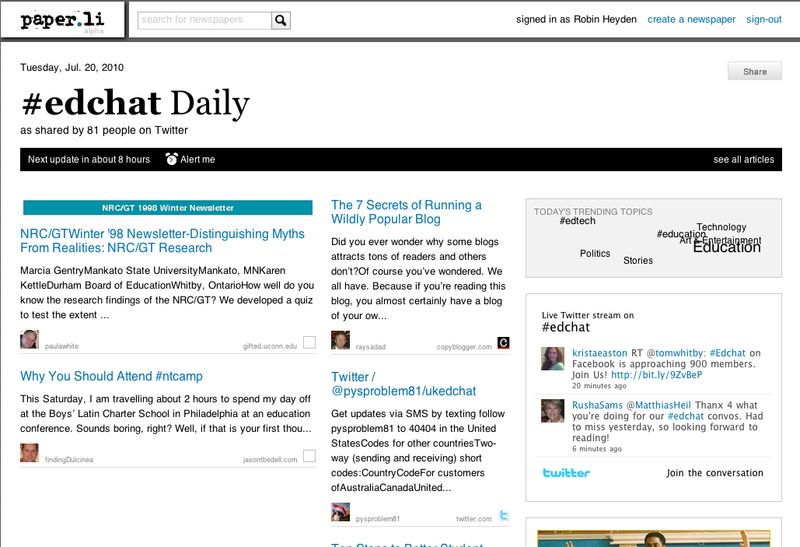 You could set up a class blog or individual student blogs. Or you could do a combination of both, where the individual student blogs all roll up (and feed into) a class or “mother blog”. Students write about their experiences, the photos the data – they tell the succession story in installments. The key is to get them to read and comment on each other’s posts. You could also line up some outside content experts (or other teachers, NABT friends) to comment on the students’ posts. That’ll really fire them up! Comic Books: A fun way to tell a story that seems to appeal to kids. There are a number of programs to do this that are very easy to use and allow for a tremendous amount of creativity. For instance, Comic Life (a Mac program) is one I use frequently. It’s all drag and drop – dead easy – and your output can be jpgs or PDFs, so easy to share what you’ve created. Here’s a web-based comic creation site, Pixton, that I’ve used before with good results. Issuu: This one allows you to create and publish a “storybook” online. This would be great for anyone who had in mind creating a digital children’s book, to tell their story. 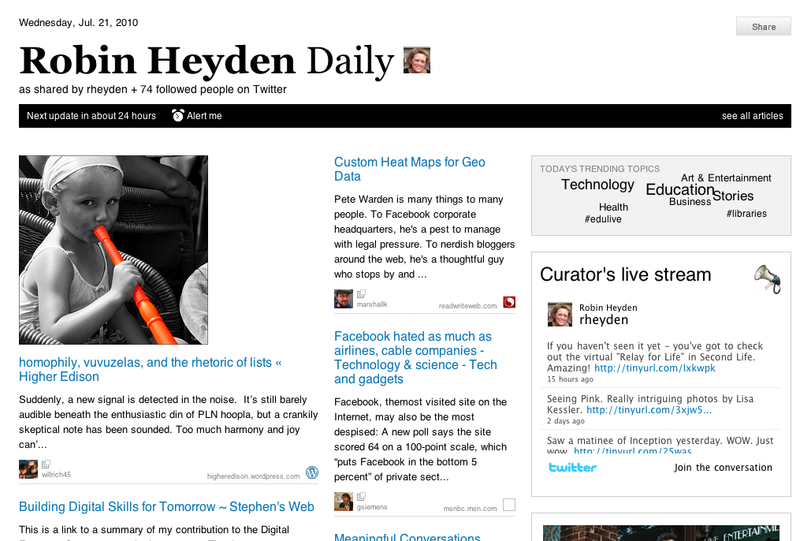 You can upload images, documents, whatever and then build it into a magazine-like narrative. In the final product, the reader flips the pages online as they work their way through. Very nice output and its easy to use this one, they could structure it so that their drawing was on the left-facing page and the photo of the same thing was on the right and then explain how the two are related. Animoto: allows you to create a sort of “music video”. Photos (that you upload) that dissolve and spin, using special effects, played to music that you choose. You can insert a sort of narrative into it by adding images with short lines of text. I’ve seen some really high impactanimotos, like this one on the light reactions. Include Drawings: You mentioned that you’d like to their hand-rendered drawings in the final product. If you have access to a scanner, they could scan them in and include those drawings as jpg. Easy. So, basically, with any of these programs, the idea is to make sure that all of their assets are jpgs (whether they are photos or scans) and just upload those into the application of choice. You can use Skitch (for Mac) or SnagIt (for PC, but that one’s not free) to add illustrations, doodles, and annotations to your uploaded images or screen captures. Google Maps and Google Earth: Images and/or footage from these tools could be nicely incorporated into the student projects. Done simply, they could use Google maps or Google Earth images (screen shots, uploaded as jpgs). At a more complex level, they could create a Google Earth movie (a screencast) that zooms in on the dunes location, giving relational information or they could create a kmz file (an overlay) that zooms the viewer from place to place in a predetermined way. There are a number of tools that allow you to do screen casts of the action on your screen – my favorite is Screencast-o-matic. And speaking of screencasts, students could use a tool like Eyejot to record a short, talking head video using the web cam on your computer. The New York Times and the Morgan Library have just given us all an early Christmas present. The manuscript of Charles Dickens’ classic holiday ghost story, A Christmas Carol, is securely housed at the Morgan Library and Museum in New York City. After Charles Dickens wrote the book, he bound his manuscript in red morocco as a gift for Thomas Mitton, his solicitor. The red book passed through several owners before Pierpont Morgan acquired it in the 1890’s, and its been in the Morgan collection ever since. Scholars are occassionally given access to the manuscript but the visiting public can only view it, once a year, during the Christmas season, under a glass case in the museum. Museum curators thoughtfully display a different page each year, but, that still just comes down to one page a year – and only if you can get yourself to NYC. But this year (and here’s the Christmas gift), the Morgan Library allowed the New York Times to photograph and display the entire handwritten manuscript online. From the comfort of your counting house, you can view the entire manuscript. Since Dickens’ penmanship left a bit to be desired, they’ve set it up so that you can toggle between the actual, hand-written manuscript, and a typed version of it. Not only that, you can zoom in, you can use their search tool to find something specific and you can read permalinks, embedded in the online versions that offer interesting asides and observations from Dickens’ scholars. What a revealing thing it is to see the original manuscript of a classic like this. The first thing that struck me, when I flipped through the online pages, is what a mess it was! 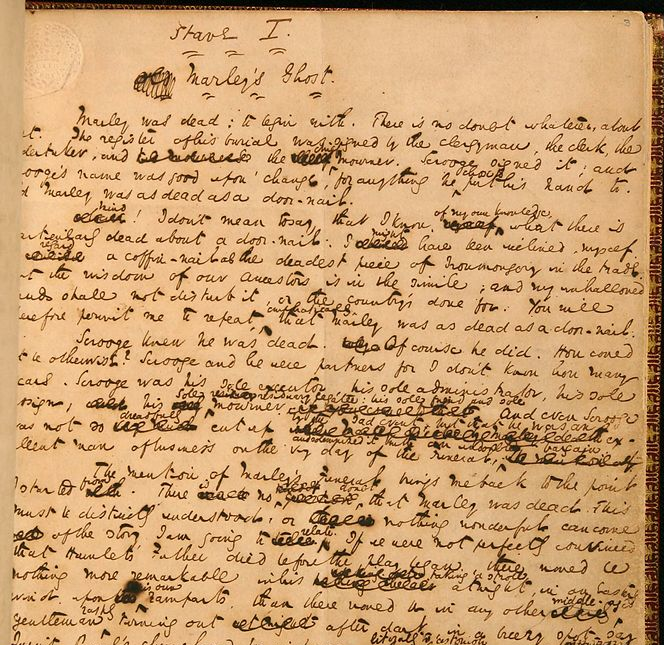 Words scratched out, whole sections deleted, others inserted, ink blots…the messiness certainly supports the story of its creation – that Dickens, apparently, wrote the whole thing in a hurried six weeks, just in time for Christmas of 1843. There are other intriguing observations that come to light from examining the manuscript. For instance, on page 48, Dickens changes some wording around the ghost of Christmas Present – he goes from “using his own words against him” to “turning on him for the last time with his own words.” This change makes it clear that Dickens was setting up a more confrontational scene, making it more obvious that the ghost has lost his temper. Another example is that the name “Bob Cratchit” doesn’t appear until the middle of the story. What else can you find in there? And how might you use a resource like this with your students? My brother-in-law, Todd Heyden, who is a Professor of English, teaching composition and literature at Pace University in NYC, suggested some very insightful teaching ideas around this material. He explained to me that one of the hardest things to get across to his students is that writing is a recursive process (the old adage “writing is re-writing”) – what better way to prove the point than to show the Dickens “drafts” as an example? Even Charles Dickens crossed things out, reconsidered, and revised. 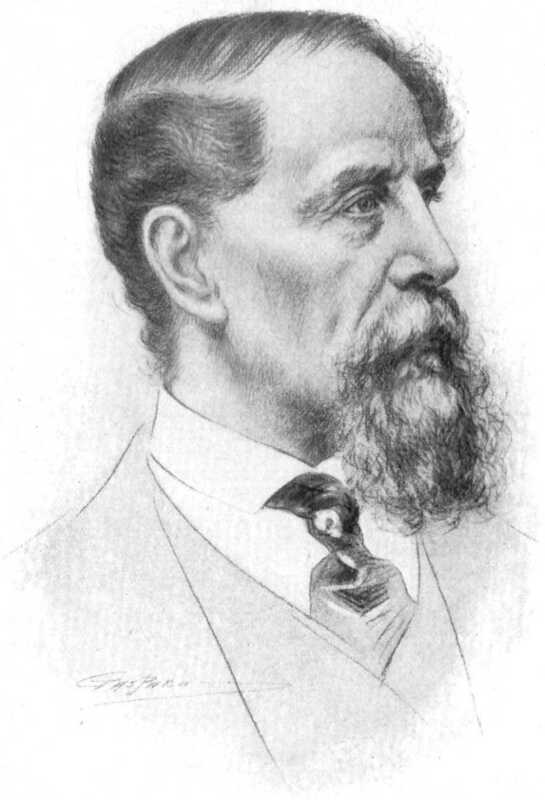 He also reminded me that Dickens’ fame grew as a result of reading his work aloud to audiences. Telling students about this, suggesting that some of Dickens’ revisions undoubtedly came from his consideration of how his work sounds to a listening audience (maybe have them read some of the story aloud in class ?) will help attune them to this notion. The best test of a sentence is to read it aloud – how does it sound? Todd regularly structures an in-class activity where he pairs students, asking them to read their papers aloud to eaach other (with the listener making no suggestions). Just by hearing themselves read their work aloud, he tells me, they are compelled to consider their audience — and to revise. Here’s another thought – the New York Times started a contest, to go along with the online manuscript, for readers to catch some of the 2000 edits that Dickens made on the manuscript and write in (on the associated blog), with their observations. Maybe invite your students to participate? Absolutely enchanting. Thank you New York Times! Do you know how to take a picture of whatever is happening on your computer screen (known as a “screenshot”) and then play around with it and fancy it up? If you do, find another entry on my blog to browse. If you don’t — read on! Taking a screenshot (and then futzing with it) can be a very, very useful thing to know how to do. For instance, you might want to highlight a few key elements of the shot, draw an arrow to point out a particular event happening, write an explanatory call-out in your own words, or layer an additional image on top of the screen shot. I use screen shots primarily to give people directions. For example, I use them to provide step-by-step instructions on how to edit a wiki or how to sign up for Second Life and get your avatar. Using screenshots to illustrate your story is really helpful, but it’s even better if you can annotate and draw on them. Teachers can use screenshots as a way to determine whether or not a student has completed an online assignment. For example, if you ask your students to complete an online activity for homework, ask them to email you a screenshot of the finished activity. There’s only one way they can get that. 1. Jing. This handy little free app works with both PC and Mac and it can not only snap a picture of your screen but you can record short videos of on-screen action as well. You just download it and the icon sits on your desktop, to be used whenever. You can save your images/videos to your computer or you can take advantage of Jing’s ability to host your shots on their server and spawn links to your created items. 2. Evernote. This one is really a powerful tool and can be used for much more than just screen shots. It’s really an uber note-taking device – a way to clip, store and organize all your various notes, lists, and ideas in one, handy online place. So you can type yourself textnotes, clip a web page, snap a photo, or grab a screenshot. Definitely worth checking out. 3. Irfanview. This is a PC-only, free tool that’s quite powerful. You can certainly do screengrabs with it but it also has an image editor so you can resize, add call-outs, arrows, whatever. 4. Screendash. With this one you can capture images from your screen, a webcam or an iphone. You can draw on the captured images, enhance them, add clip-art, change sizes. LIke Jing, ScreenDash will save your images on their server and spawn a link for you as well. Free and very easy to use. 5. FireShot. This is an add-on for use with the Firefox browser so youll only be interested in this one if you regularly use Firefox AND if you have a PC (since this little baby is not available for MacOSX). This little plugin provides a sert of editing and annotations tools that can be saved to your hard drive or uploaded to a public server. 6. Grab. If you’re on a Mac, you already have this one (in the Utilities folder). Very spiffy. You just tell it what kind of a capture you want to do (selection, window, screen, timed screen). With this one you can include a cursor or a pull-down menu in your shot. So, now that you know how to take and augment screenshots – what are some of your ideas for using them? Here’s an online utility that you might want to consider using for student projects – – online book creation sites. Sites like Lulu, XLibris, and Bookemon are free utilities that allow you to create a book, using your own assets (text and images). These sites are well designed, easy and intuitive to use. In order to build your own book, you go to the site of your choice, create a free account, upload your pictures or text (word documents) and the site creates the book for you. On Lulu and XLibris, you can create your own cover design. In the case of Bookemon, you can go further and design your own layout, adding text boxes, borders, and frames. Once your book is just as you want it, you can publish it and – if you want – buy a copy. The price of the printed book depends, of course, on a variety of factors (e.g. length, color, type of binding) but you can typically purchase a 50-page physical book for about $20. On the Lulu site you can list your book in their online catalog for others to purchase and you can offer up ebook versions of it for people to download. On the bookemon site, you can share the online version of your book with others either by providing a link or embedding code into your web site or social networking site. Here’s a 41-page book on Acadia National Park that one of Cheryl Hollinger’s AP Biology students (from York, PA) created using the Bookemon site. The photos above are pages from this students’ book. Her wonderful creation gives the reader a very good feel for the park – both scenically and biologically. And she was careful to provide references and options for more information at the end. Poetry, cookbooks, memory books, or books on a topic (like Cheryl did with her students) all sound like useful and creative ways for students to express themselves.